Elevate Your Lifestyle . . .
High Rise Living was once reserved for the very top tier of the economically privileged. The Condos lining Turtle Creek Blvd might as well have been in the Upper East Side of New York since they were about as accessible as Central Park. Their owners were the ‘Who’s – Who’ of Dallas. 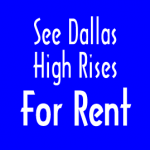 Over the years, and more importantly of late, High Rise Living has become a very real and affordable option for a wide variety of Dallasites of all ages, and across a broad economic spectrum. High Rise Apartments are one of the fastest growing market segments throughout the Intown neighborhoods; and now dot the skylines of Uptown, Downtown, and Victory Park. Some of the older Condos are now almost at entry level prices. So what is the great appeal of living in a High Rise. For most, it is the Care-Free Lifestyle that most Condos offer. No grass to cut, no roofs to worry about. For others, security is a prime factor. Still others are lured by ‘Lock It & Leave It’ which lets residents travel with the knowledge that ‘Home’ is waiting when you return. 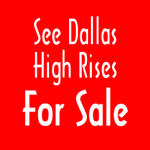 Intown offers a wide variety of High Rises, For Sale and For Rent, in many Dallas neighborhoods; in many styles, sizes, and prices. If you are looking for the ‘Carefree’ lifestyle demanded by ‘Busy Professionals’ and on-the-go ‘Empty Nesters’; then High Rise living might be an excellent choice. Check out the Listings below to preview some of Dallas’ most desirable High Rises; and then call an Intown Associate to see first hand.